Just got this in a MUA trade. I had purchased a set earlier in the year for a Christmas present. This one is mine, all mine! 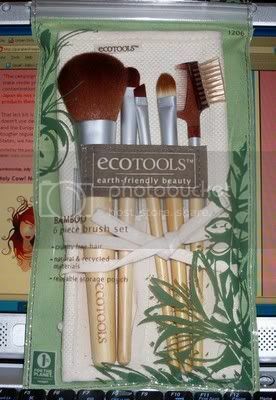 There was even a .50 off other Ecotools products inside. I hear rave reviews for these. They are synthetic and made with bamboo and recycled aluminium for the ferrels. Once I had them out of the package, I was surprised they were so lightweight. They are full size, but would work nicely as purse brushes. I haven't washed these yet, but they feel wonderfully soft. I need more makeup brushes like a hole in the head, but I just had to try these out. I really like the cotton and hemp roll that comes with them. 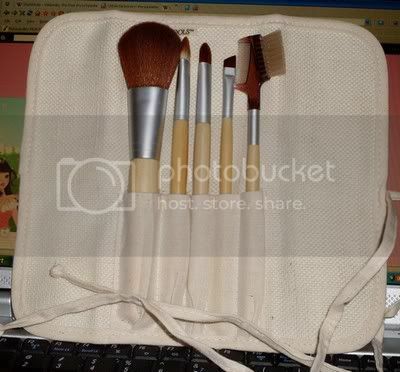 Can be washed and re-used with other brushes. They look really nice! I really wanted to try these out, but I could never find anywhere that sells them here! I might just order them online.. The set that I purchased was from Target. They have a whole display of these, but they are on a bottom shelf at multiple stores. You may be missing them! These have fast become some of my favorite brushes! There's another set that comes with a great blending/crease brush (it has a mini kabuki in it) and I HIGHLY recommend that set as well. I just wish they sold the crease brush separately. I ended up buying 2 sets so I could have two of them! I find that these brushes are as nice as my MAC brushes, and a little better quality than my Sonia Kashuk brushes (which are still very nice, too).